There is no annual shareholder meeting in America -- or probably the world -- like Berkshire Hathaway's. Thousands of Warren Buffett fans flocked to the CenturyLink Center in Omaha the day before the meeting for a chance to purchase Berkshire-themed trinkets from subsidiaries Heinz, Fruit of the Loom and Oriental Trading. And eat Dilly Bars from Dairy Queen. Just about everyone was walking around with one. The CenturyLink was open a day earlier than usual to celebrate the 50th anniversary of Buffett taking control of Berkshire (BRKA). 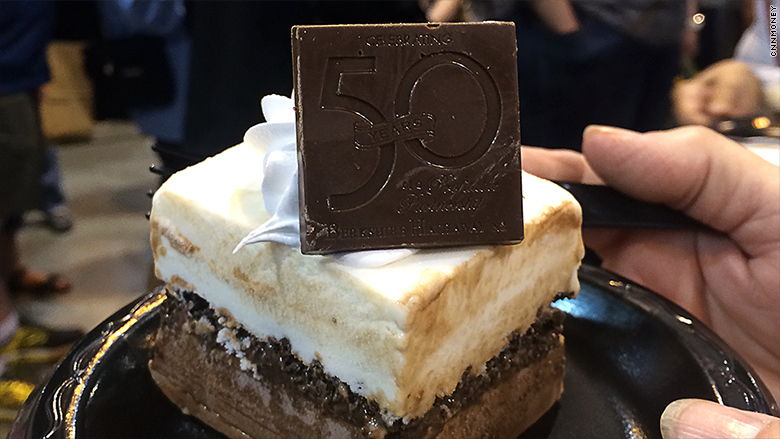 Dairy Queen had a gigantic ice cream cake for the event. Doug Dentler, who was attending the meeting for the first time and had his wife and two kids with him, said he decided to come this year since he just moved to Wisconsin. So it's not that far of a trip. 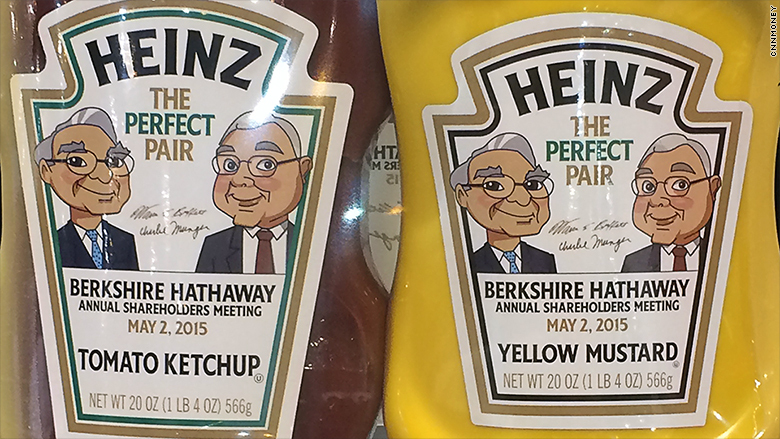 When I spoke to him, he was buying commemorative bottles of Heinz ketchup and mustard featuring cartoon drawings of Buffett and Berkshire (BRKB)vice chairman Charlie Munger. Dentler also bought some investing books. He said his wife was shopping at the Pampered Chef booth. Elizabeth Billings, a 15-year-old from Omaha, is a Berkshire meeting veteran. She said she's been a shareholder since she was 1 thanks to a gift from her grandparents. Billings, waiting on line for See's Candies, was also planning to buy the ketchup and mustard combo and head to the Fruit of the Loom booth. Like Dentler, she bought a bunch of investing books as well. ConAgra (CAG) and Disney (DIS) are two other stocks she owns. But she said she wants to own Berkshire "forever." Ken and Darlene Blair made the trip from Alberta, Canada. They've only owned the stock for about a year and bought it mainly so they could come to the meeting. "Seeing Warren will be the highlight of our trip," Darlene Blair said. They too were buying investing books and also purchased chocolates from See's, pens from jeweler Borsheims and ... you guessed it ... the Warren and Charlie mustard and ketchup. Brothers Brendan and Cameron Harrington traveled even further to get to the meeting. They are from Australia. The two run an investment fund and described their investment strategy as similar to Buffett's. They look for value stocks. Brendan said he had spent about $350 on books. The brothers were leaving Fruit of the Loom and on their way to shop for things from running apparel maker Brooks. I told Cameron, who was wearing a T-shirt from rival Under Armour (UA), that he may want to quickly find another shirt. "Maybe Brendan will just go," he quipped. Sheila Nelson, an Omaha native and longtime shareholder, was shocked to see such a big crowd. 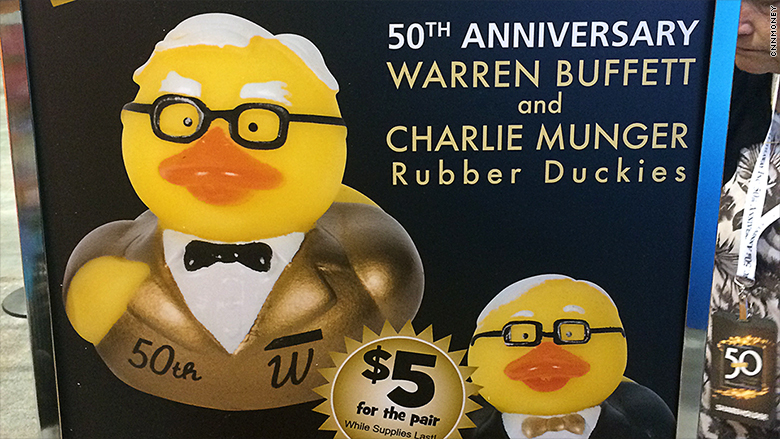 "I was hoping nobody would be here," Nelson said while looking at the Warren and Charlie rubber ducks from Oriental Trading. Ernie from Sesame Street might like these toys: They make investing lots of fun! But Kathy Soula, also from Omaha, said that she was expecting a big turnout. 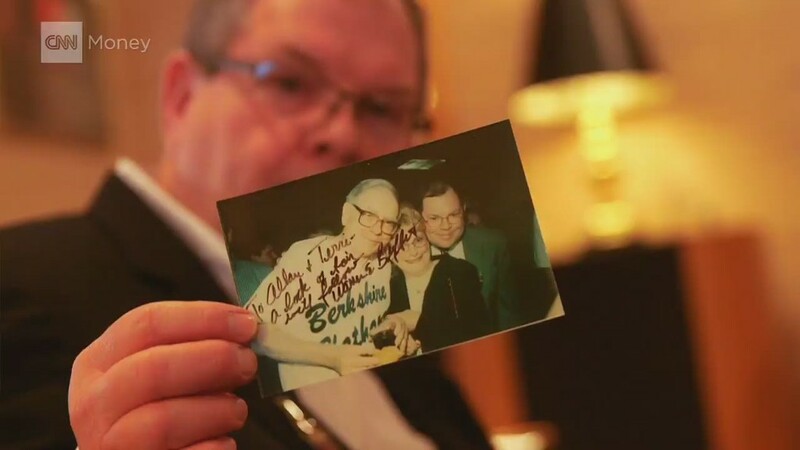 This is Warren Buffett after all. Soula had a tote bag from Burlington Northern Santa Fe that showed Warren and Charlie on top of a train. She also bought a 50th anniversary book of Buffett's famous shareholder letters as well as some M&M's. (M&M owner Mars co-owns Wrigley with Berkshire). And she had items from Fruit of the Loom that she didn't want to talk about. I was happy to not pry. The Berky Boxers from Fruit of the Loom have long been a top seller at the Berkshire event. This year, Fruit of the Loom also had a Berky sport bra with the letters BRK in gold on them. Now that brings the term shareholder support to a whole new level.